Otto Mündler [1811-1870], Paris; (his sale, Hôtel Drouot, Paris, possibly 27 November 1871, no. 48, or 30 November 1871, no. 52); Gustave Dreyfus [1937-1914], Paris; his heirs; purchased 1930 with the entire Dreyfus collection by (Duveen Brothers, Inc., London and New York); sold March 1937 to the Samuel H. Kress Foundation, New York; gift 1939 to NGA. The item in question is listed, without measurements, as "Petit portrait d'homme vue en buste" and attributed to Morone in the catalogue of 27 November and as "Petit portrait d'homme" by an unknown artist in the catalogue of 30 November. See Die Sammlung..., 1930: 448; Frank Rutter, "Notes from Abroad," International Studio 96 (August 1930): 65; Frank Rutter, "Notes from Abroad. The Dreyfus Collection--Other Notes," International Studio 97 (September 1930): 60-62; as well as Carlyle Burrows, "Letter from New York," Apollo 13 (1931): 110-111. The Duveen Brothers letter confirming the sale of twenty-four paintings, including NGA 1939.1.263, is dated 9 March 1937; the provenance is given as "Dreyfus Collection" (copy in NGA curatorial files; reel 329, box 474, folder 5, Duveen Brothers Records, accession number 960015, Research Library, The Getty Research Institute, Los Angeles). Italian Renaissance Portraits, M. Knoedler and Co., New York, 1940, no. 2, repro. Le Muse e il Principe. Arte de corte nel Rinascimento padano, Museo Poldi Pezzoli, Milan, 1991, no. 57, fig. 172, as Profilo di fanciullo by Francesco del Cossa. Duveen Brothers. Duveen Pictures in Public Collections of America. New York, 1941: no. 59, repro., as by Jacopo Bellini. Preliminary Catalogue of Paintings and Sculpture. National Gallery of Art, Washington, 1941: 22, no. 374, as by Jacopo Bellini. Book of Illustrations. National Gallery of Art, Washington, 1942: 247, repro. 71, as by Jacopo Bellini. Frankfurter, Alfred M. The Kress Collection in the National Gallery. New York, 1944: repro.,as by Jacopo Bellini. Paintings and Sculpture from the Kress Collection. 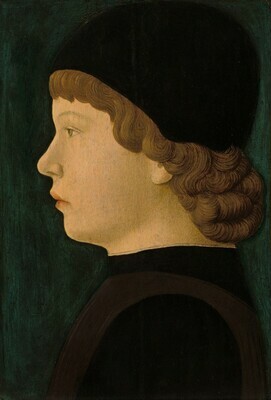 National Gallery of Art, Washington, 1945 (reprinted 1947, 1949): 83, repro., as Portrait of a Boy by Jacopo Bellini. Paintings and Sculpture from the Samuel H. Kress Collection. National Gallery of Art, Washington, 1959: 130, repro., as by Jacopo Bellini. Summary Catalogue of European Paintings and Sculpture. National Gallery of Art, Washington, 1965: 13. European Paintings and Sculpture, Illustrations. National Gallery of Art, Washington, 1968: 5, repro. Shapley, Fern Rusk. Paintings from the Samuel H. Kress Collection: Italian Schools, XV-XVI Century. London, 1968: 29-30, fig. 92. European Paintings: An Illustrated Summary Catalogue. National Gallery of Art, Washington, 1975: 24, repro. Shapley, Fern Rusk. Catalogue of the Italian Paintings. 2 vols. National Gallery of Art, Washington, 1979: I:87-88, II:pl. 58, as by Francesco Botticini. European Paintings: An Illustrated Catalogue. National Gallery of Art, Washington, 1985: 43, repro. Boskovits, Miklós, and David Alan Brown, et al. Italian Paintings of the Fifteenth Century. The Systematic Catalogue of the National Gallery of Art. Washington, D.C., 2003: 226-229, color repro., as Attributed to Francesco del Cossa.